We exit our taxi expectantly and are greeted by a woman standing by an unassuming door. One person in our party of four is handed a paper napkin crafted into a beautiful white flower. We are instructed to enter a “garden” and find three flowers that match. The long dark corridor is made beautiful by hanging glass vases with flowers. It smells like spring. We find our match, sniff in the sweet aroma and sigh in unison. Do we eat this? None of us remember the instructions, too giddy to focus. We open the door at the other end of the hallway. There we are reassured that the flower’s center is edible. We bite into a delicate wisp of cotton candy, floral scented, and infused with passion fruit and a hint of coriander. This is our welcome to Alinea. Our excitement is palpable. We have traveled to Chicago for the express purpose of dining here. We have talked about it with our friends for two years, and the fact that both couples are celebrating 30th anniversaries this year is the perfect excuse. We have been trying to temper our enthusiasm so that we are not disappointed, but it is an effort. We have all read “Life on the Line,” Chef Grant Achatz’s story of his culinary journey and his battle with tongue cancer. We are aware of the chef’s accomplishments and the restaurant’s numerous awards. 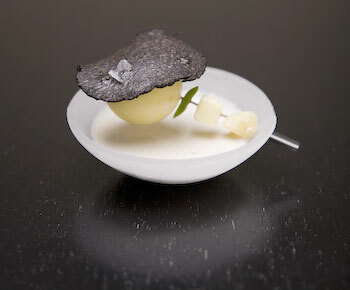 Alinea currently ranks #15 in The World’s 50 Best Restaurants 2013. The restaurant is ranked #3 in the U.S., just behind Eleven Madison Park and Per Se. It also has three Michelin stars- the highest possible ranking in the guide. 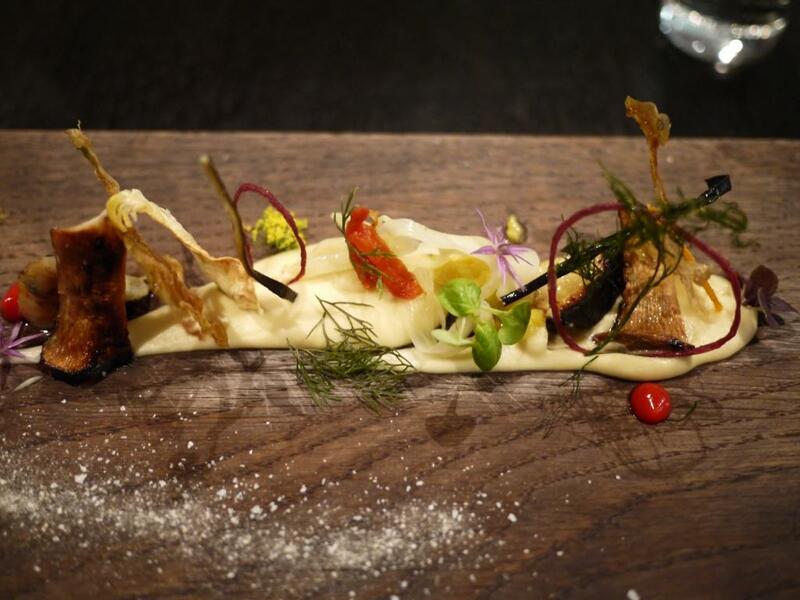 It is difficult to describe Alinea, because it is so much more than the best meal one could imagine. It is art. It is theater. It is a symphony. It is magic. Part of the joy of Alinea is the element of surprise. Transformation occurs at every turn. I cannot begin to describe every dish in detail, but I will share highlights and photos. Chef Achatz is all about keeping things fresh and interesting, and change is a necessary part of this process. So if there is something here that you find appealing, chances are good it will be gone by the time you visit. Rest assured it will be replaced by something equally spectacular. We are led to an upstairs table. Large cylindrical vases filled with water, greens, and flowers are placed beside each of us. Is it a centerpiece? Is it something to eat? We have just arrived and yet we know this is a meal in which we will be played, and we will play. We are game. All at once comes a barrage of vertical dishes and multiple instructions. A scallop is cooked on a hot stone, a piece of red snapper is soaked in tea, yet another fish is in a covered glass in which we remove a string and a puff of smoke is released into the air. This science experiment keeps us delighted for some time. The stunning architecture of the plates that follow are awe-inspiring. 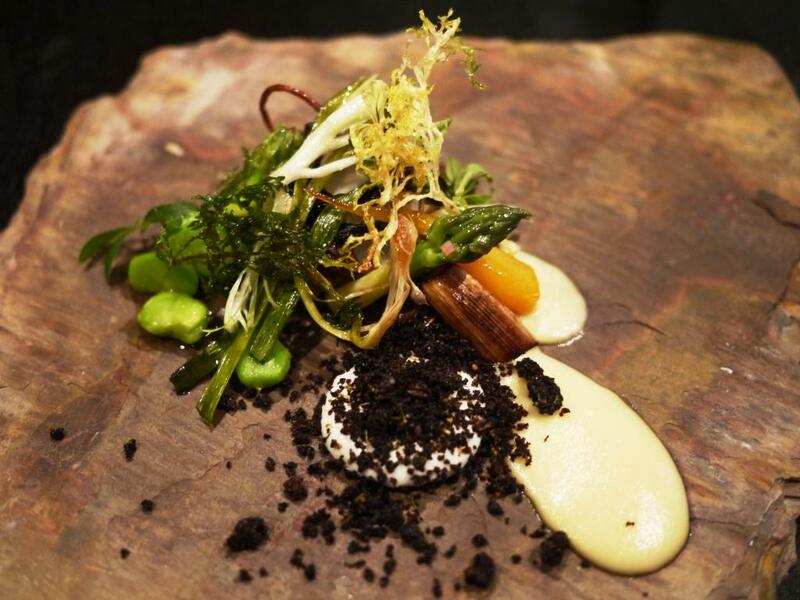 The artistry leaves us speechless, as does the perfect melding of flavors and textures. Hot potato, cold potato requires the diner to pull a pin, which release the ingredients into a small dish. The shock of truffle flavor has me singing “I love truffles!” A server overhears and repeats my song when she delivers a signature dish called “black truffle explosion” shortly thereafter. We are charmed. My favorite dish of the evening is even more participatory than the others. The meat eaters are presented a plate with five preparations of duck, including foie gras and confit. The fish-eaters have a similar plate of turbot. What comes next is a gorgeous tray of accoutrements: sweet, savory, herbal, fruity, etc. We are instructed to experiment with two or three different toppings to pair with our proteins. The tables have turned, and we are now each chef and artist, creating a masterpiece of our own. There is an intermezzo as we transition from savory dishes to sweet. 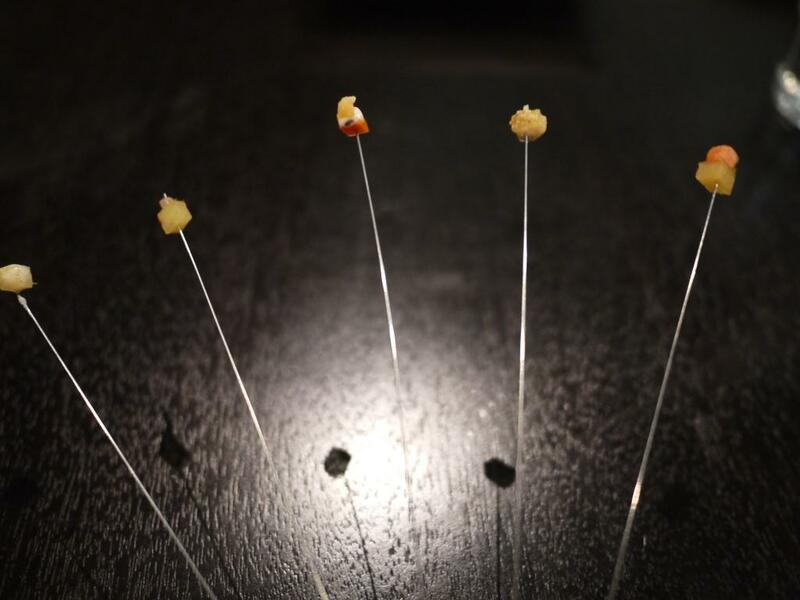 Five infinitesimal slivers of ginger are presented on wire skewers. They are to be consumed from right to left, as they grow progressively more intense in flavor. We marvel at the flavor emanating from such tiny morsels. Throughout the meal, every sense has been engaged. There are sights to behold, thrilling aromas, foods to be manipulated by touch, and tastes that defy description. It is time for sound to play a role. 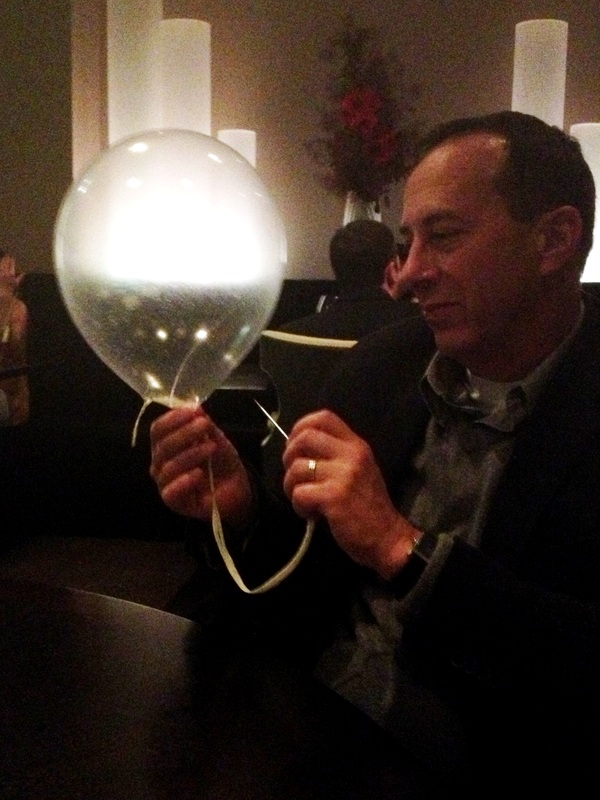 We are handed a balloon, asked to remove our glasses, kiss the balloon, and inhale. It’s time to return to childhood, as we are encouraged to speak to each other in helium-induced squeaky voices. The tastes and smells are of green apple. I end up with the sticky substance all over my face and hands, indeed returning to my youth. As the dessert round continues, we become nostalgic as dishes pass by that delighted us an hour or two earlier. “Remember the caviar?” we say wistfully. We purposefully savor every moment that follows. 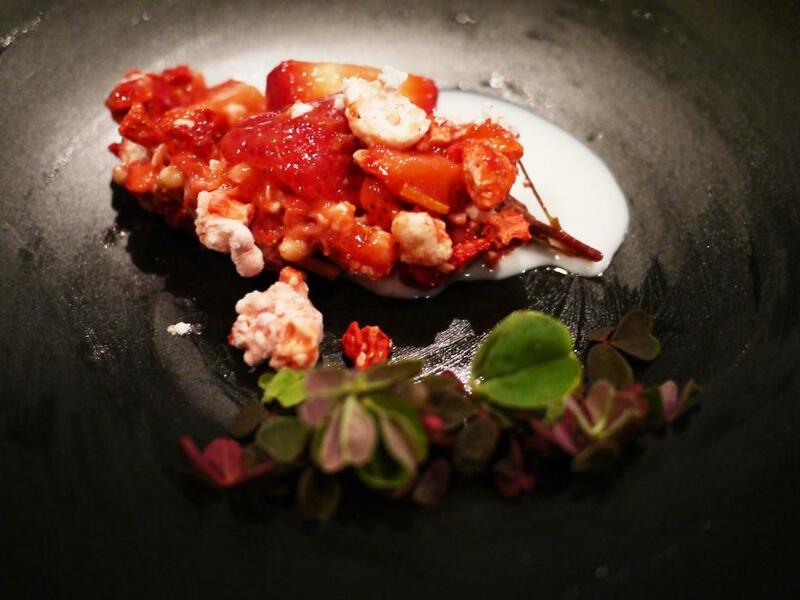 Strawberry with sorrel, sassafras, and pine nut is a symphony of textures. Some strawberries are semi-frozen, others soft and tart, while crunchy stems add an interesting note. All blend together into a crescendo of flavor. Chef Achatz has appeared in the dining room throughout the evening, preparing the final dessert course. He is solemn and intense. No one attempts to interact with him. I begin to wonder if it is a no-no to address him. I ask the server, knowing that refraining from an exchange will be difficult. She explains that he is reserved, but does not discourage us. My heart begins to pound as the master artist/maestro approaches our table. My friend immediately tries to engage him. “We are so excited to be here, we’ve traveled all the way from DC, we’ve talked about this for years, etc. etc.” Finally chef looks up to inquire where we like to dine in DC. Knowing he worked with Chef Eric Ziebold at The French Laundry, my friend replies “CityZen.” We rattle off a few more DC area restaurants, and ask him the same question. “Komi,” he replies. 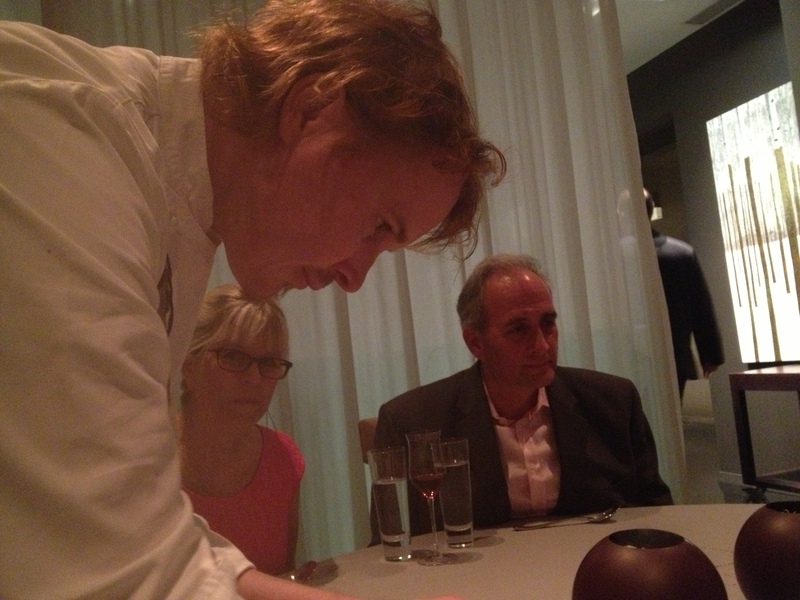 As we are playing this game, Chef Achatz is painstakingly painting sauces on our table. Two seemingly hollow globes of chocolate are placed before us. Suddenly there is a loud noise. Chef and an accomplice have dropped the orbs on the table, causing an explosion of bits of chocolate, pieces of waffles, small flowers, and wisps of cotton candy. 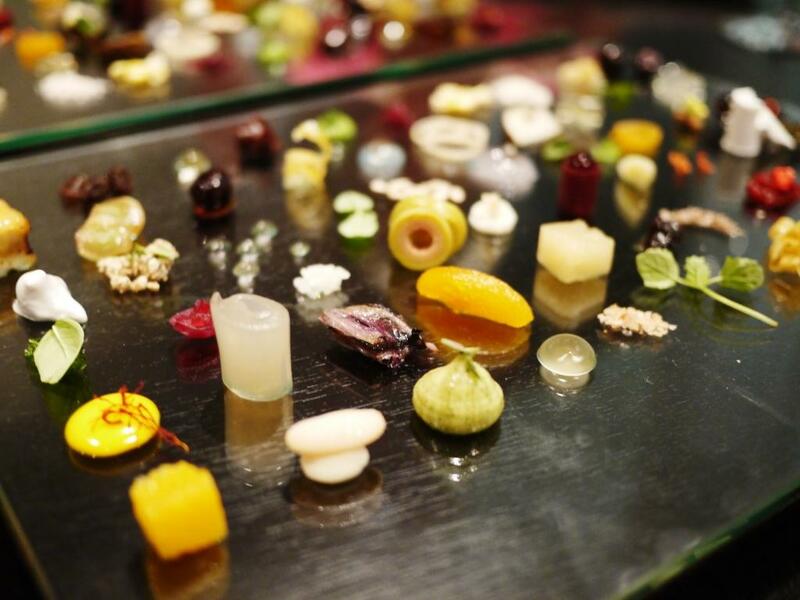 We are completely mesmerized by the fantastic dessert display, not even realizing that Chef Achatz has disappeared. Many people have inquired about the cost, knowing that food of this caliber doesn’t come cheap. It’s a question I hesitate to answer. 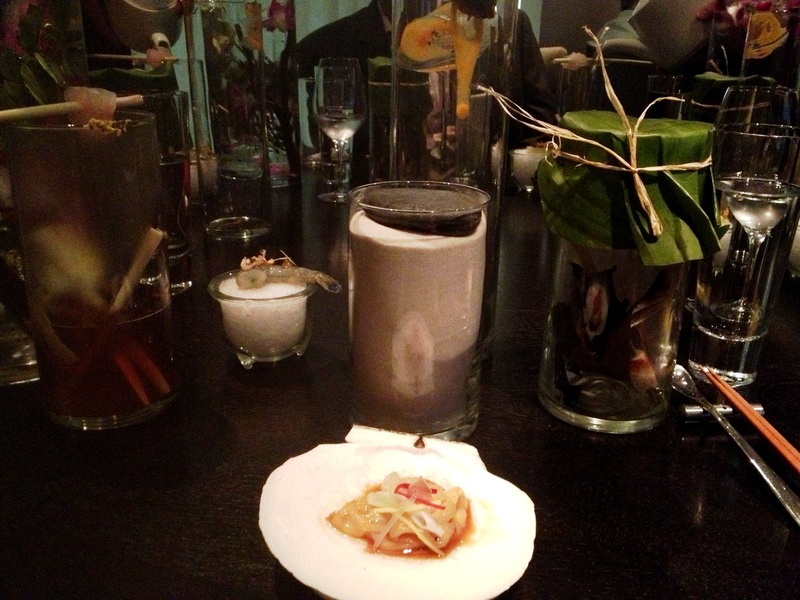 To dine at Alinea is to engage in a sensory symphony. 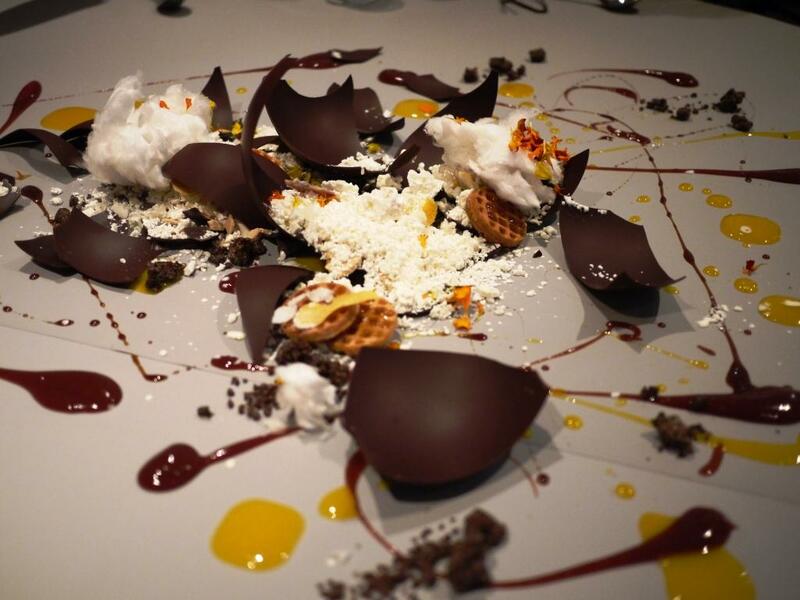 Grant Achatz has created an iconic experience at Alinea. It may not be for everyone. 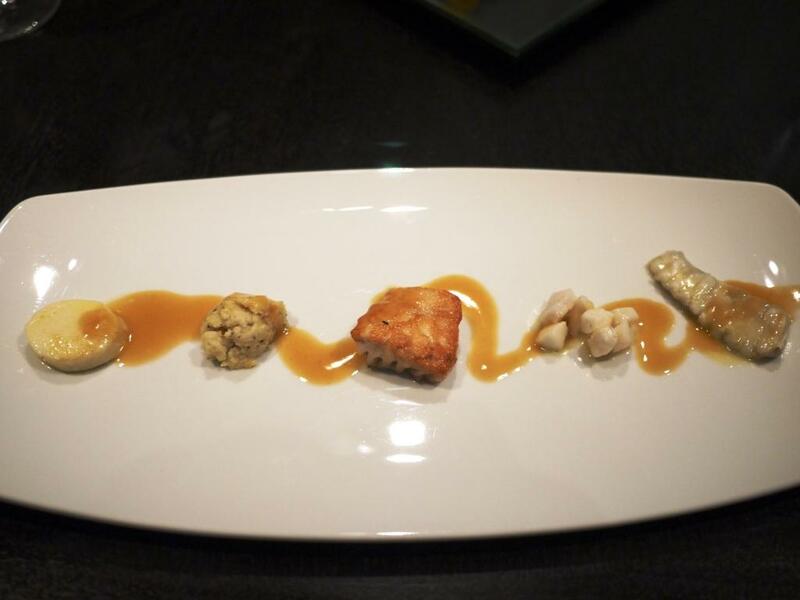 But if you can consider food to be an expression of artistic creativity that fuels emotion and satisfies the appetite, then a visit to Alinea is priceless.